Hello once again my ever supportive readers, this is yet another unfortunate result of my bad titles, I would like to use this segment to upload sudden and shocking news, since this is my first post on this topic I unfortunately only have one major news today( because I am writing this from my economics class). 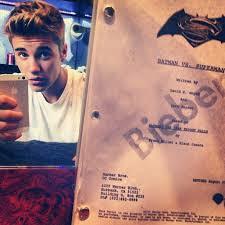 Apparently last week, the Selena Gomez’s previous heartthrob, namely Justin Burner released a picture of him holding a script of the upcoming Man of Steel sequel with his name labeled on it. This instantly caused a media uproar as various people began to speculate that he could be playing the thights wearing Boy Wonder, Robin who is Batman’s sidekick in the comics( seriously didn’t you know that already). Well it turns out that it was a prank that the Canadian pop star played on us all as it was a screenshot of an upcoming funny or die sketch. So you DC fanboys can calm down now, but I have to hand it to Justin for such an elaborate prank. This is all I have for today. Stay tuned for more watchouts. Till next time. Szia.